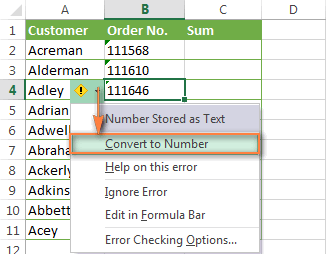 The tutorial explains how you can quickly cope with VLOOKUP not working problems in Excel 2016, 2013, 2010, 2007 and 2003, troubleshoot and fix common errors and overcome VLOOKUP's limitations. However, it's not without a reason that many Excel specialists consider VLOOKUP to be one of the most intricate Excel functions. It has a ton of limitations and specificities, which are the source of various problems and errors. In this article, you will find simple explanations of VLOOKUP's #N/A, #NAME and #VALUE error messages as well as solutions and fixes. We will start with the most frequent cases and most obvious reasons why vlookup is not working, so it might be a good idea to check out the below troubleshooting steps in order. In Vlookup formulas, the #N/A error message (meaning "not available") is displayed when Excel cannot find a lookup value. There can be several reasons why that may happen. It's always a good idea to check the most obvious thing first : ) Misprints frequently occur when you are working with really large data sets consisting of thousands of rows, or when a lookup value is typed directly in the formula. If the lookup value is smaller than the smallest value in the lookup array. If the lookup column is not sorted in ascending order. If you are searching with exact match (range_lookup argument set to FALSE) and the exact value is not found, the #N/A error is also returned. See more details on how to properly use exact and approximate match VLOOKUP formulas. As you probably know, one of the most significant limitations of Excel VLOOKUP is that it cannot look to its left, consequently your lookup column should always be the left-most column in the table array. 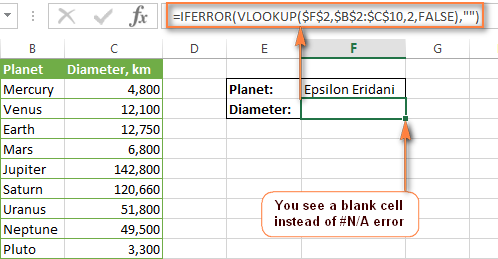 In practice, we often forget about this and end up with VLOOKUP not working because of the N/A error. Solution: If it is not possible to restructure your data so that the lookup column is the left-most column, you can use a combination of Excel's INDEX and MATCH functions, as a more versatile alternative to VLOOKUP. You will find the detailed info and a formula example in this tutorial - INDEX / MATCH formula to lookup values to left. Another source N/A errors in VLOOKUP formulas is numbers being formatted as text, either in the main or lookup table. This usually occurs when you import data from some external database or if you've typed an apostrophe before a number to indicate a leading zero. The most obvious indications of numbers being formatted as text are shown in the screenshot below. The numbers can also be stored in the General format. In this case, there's only one noticeable sign - numbers get aligned to the left side of a cell, while numbers stored as numbers are aligned to the right by default. Solution: If this is just a single number, simply click on the error icon and choose "Convert To Number" from the context menu. If multiple numbers are affected, select them all, right-click the selection, then choose Format Cells > Number tab > Number and click OK. This is the least obvious cause of the Vlookup N/A error because a human eye can hardly spot those extra spaces, especially when working with big tables where most of the entries are below the scroll. For more information about using INDEX / MATCH in Excel, please check out this tutorial: INDEX & MATCH in Excel - a better alternative to VLOOKUP. Tip. 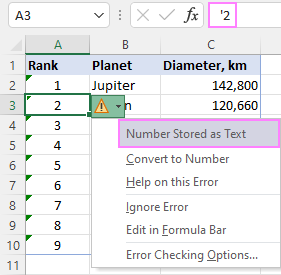 A quick alternative to complex INDEX / MATCH formulas is running the Trim Spaces for Excel add-in that will eliminate excess spaces both in the lookup and main tables in seconds, making your VLOOKUP formulas error-free. This is a free tool and you can find the download link on the above page. In general, Microsoft Excel displays the #VALUE! error if a value used in the formula is of a wrong data type. In respect to VLOOKUP, there are two common sources of the VALUE! error. You can learn more about using INDEX / MATCH in Excel in this tutorial. If you are pulling data from another workbook, you have to include the full path to that file. More precisely, you have to enclose the workbook's name (including the extension) in square brackets , and then specify the sheet's name followed by the exclamation mark. Also, you should have apostrophes around all this in case either a workbook or spreadsheet name contains spaces. 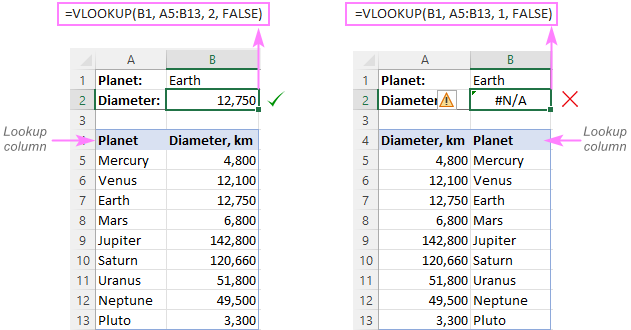 The above formula will search for the value of cell A2 in column B of Sheet1 in the "New Prices" workbook, and return a matching value from column D.
If any element of the path is missing, your VLOOKUP formula won't work and return the #VALUE error (unless the lookup workbook is currently open). For more info about VLOOKUP formulas referencing another Excel file, please check out this tutorial: How to do vlookup from a different workbook. It's hard to imagine a situation when someone would want to enter a number less than "1" to specify the column to return values from. Though, it may happen if this argument is returned by some other Excel function nested in your Vlookup formula. So, if the col_index_num argument happens to be less than 1, your Vlookup formula will return the #VALUE! error too. If the col_index_num argument is greater than the number of the columns in the specified table array, Vlookup formulas return the #REF! error. This is the easiest case - the NAME error appears if you've accidentally misspelled the function's name. Apart from having a fairly complicated syntax, VLOOKUP has arguably more limitations than any other Excel function. Because of these limitations, seemingly correct Vlookup formulas might often deliver results different from what you expect. Below you will find solutions for a few common scenarios when VLOOKUP fails. The VLOOKUP function does not distinguish case and teats lowercase and UPPERCASE characters as identical. So, if your table includes several similar entries that differ in the uppercase or lowercase chars only, the Vlookup formula will return the first found value regardless of the case. Solution: Use another Excel function that can do a vertical lookup (LOOKUP, SUMPRODUCT, INDEX / MATCH) in combination with the EXACT function that can match case. You can find the detailed explanations and formula examples in this tutorial - 4 ways to do a case-sensitive vlookup in Excel. As you already know, Excel VLOOKUP returns the first value it finds in the return column that matches the lookup value. However, you can force it to bring the 2nd, 3rd, 4th or any other occurrence you want. If you need to get all duplicate occurrences, you will have to use a combination of the INDEX, SMALL and ROW functions. Regrettably, VLOOKUP formulas stop working every time when a new column is deleted from or added to a lookup table. This happens because the syntax of the VLOOKUP function requires that you supply the entire table array as well as a certain number indicating which column you want to return the data from. Naturally, both the table array and the return column's number change when you remove an existing column or insert a new one. Solution: INDEX / MATCH comes to the rescue again : ) In INDEX & MATCH formulas, you specify the lookup and return columns separately, and as a result you can delete or insert as many columns as you want without worrying about updating every associated vlookup formula. The heading gives an exhaustive explanation of the problem, right? Solution: Always use absolute cell references (with the $ sign) in table_array, e.g. $A$2:$C$100 or $A:$C. In the formula bar, you can quickly switch between different reference types by pressing F4. If you do not want to intimidate your users with all those N/A, VALUE or NAME error messages, you can return a blank cell instead, or display your own message. You can do this by wrapping your VLOOKUP formula in the IFERROR function in Excel 2016, 2013, 2010 and 2007 or with IF / ISERROR in earlier Excel versions. Meaning, you enter the value to check for an error in the 1st argument, and in the 2nd argument you specify what to return if an error occurs. That's all for today. Hopefully, this short tutorial will help you cope with all possible VLOOKUP errors and get your formulas to work in the way you want. 124 Responses to "Excel VLOOKUP not working - solutions for N/A, NAME and VALUE errors"
We had a problem when we upgraded to 2013. The table was located in the worksheet named "Analysis", so that worksheet reference was superfluous, and when we removed Analysis! from the formula, it adapted correctly to the new row following the sorting of the table. Thank you very much for sharing this information. I've tested this behavior and got the same results. you are really sweet girl. what you are presenting here of useful material reflects your sweetness, kind heart and sole. Thank you again love you and keep on. Thank you very much for your nice words, Jafar! You are too kind. thank you for the great information , but I review all the possible problem and I fix them , but steel #N/A! and the Looked up value is exist!! the column A have numbers which I need to make sure if it's exist or not then give me the value for it's reference. and C, D are the array index. and I used False because it's phone number I need the exact match.finally 1 will return the subscription date. they both have the same type , I check with =TYPE() , also they are match I checked with A2=D3. :) so how can I fix it? Disclaimer: I'm a newbiew with excel. I've created a table which has a couple hundred items which is referenced to by a vlookup. For some reason, when I am using the drop down to select an item, the drop down only shows 196 items from the table. Nothing more. The table array in the formula is correct and locked. BUt for some reason the dropdown list will only go so far. Help? It's hard to determine the cause of the problem without seeing your data. Anyway, this is not because of Excel limitations. Even in older versions of Excel, a limit to the number of items displayed in drop-down lists was 1,000. In modern versions it's 10,000. It's just not working. I used the wizard to build the formula =VLOOKUP('Tracking In Progess'!A:A,A:A,1,'Tracking In Progess'!A:C) and it always returns #VALUE!-- I tried swapping the lookup_value and table_array and it always returns #VALUE! I've tried doing this with five different workbooks with different data. It never works. I've tried it in 2010 and 2013 and the result is always the same. I need this function -- but I hate it! It works now that I followed Derek's comment. I have been struggling for hours , you saved my life. I would have never guessed that the lookup column had to be the leftmost column of the table array.. This is very helpful! Thank You. Unfortunately, my VLOOKUP is still not working and I'm receiving the #N/A. I know what the issue is, but can't fix it. I am looking in a range that doesn't contain the VLOOKUP value I would like (which is ok) and I just want it to return to zero (0). Is there any way I can do that in excel? My problem was a silly one my lookup search column wasn't sorted so it was returning a few N/A# but now it's solved. I owe you one and you got my gratitude it was really appreciated. Thank you very much for posting this is really useful. i what to compare my list of names, Numbers, dates in 2 sperate excel spreadsheet for each of them to finds erros.for example, i want boths spread sheet to have save figure 1245 and 1245. it if any contain 1254 then how can i corret it. example 2, i want stanley on both spreadsheet, it the ohter contain stanely, i can excel tell me the teh mistake and how can i fix it. 1- Can i use vlookup formula to search for data in an excel sheet that has blank rows or columns? 2- can i build my vlookup formula on the right of the data that I need to search it? 1) yes, the VLOOKUP formula can be used to search through blank rows/columns. 2) yes, it's up to You where You place your formula. I have an Excel 2010 document that has vlookups and other formulas. I want to share the Excel doc so that my team can update their parts and we can all be in the file. The only problem I am having is that when the document is being shared and I go to update it with new data (I am the only one on the document when I add new data) for everyone to update the vlookups stop working. What can be causing this issue? The problem I frequenly run in to is the data that is being displayed by the Vlook up is both correct and incorrect. It pulls data from the wrong cell. Im pritty sure I set everything up correctly but why would it present incorrect data why not just N/A or error? In addition some of the data is represented properly. Seems sporadic on one sheet driving me nuts. Most likely the issue is in your data or in the way they are presented: the cells format, excess spaces, merge cells, etc. I have a spreadsheet that we update daily on one tab and we use a vlookup to update information on the main tab. The problem is that there are several client names that won't update automatically after we paste the new data. We have to clear their name each day and retype it for the vlookup to work. I have ran trim and that doesn't work. Plus my colleague cannot even update the name. The vlookup won't work at all if she updates from her excel. The names are in alphabetical order. The range is covered. THe names aren't all at the end they really have nothing in common that I can see. It seems completely random. If I retype their names the vlookup does not return the #NA but if my colleague retypes their names her Excel does not update the data. I have gone crazy trying to figure this out. Help! We detfniiely need more smart people like you around. Brilliant, Thanks a lot, I've searched high and low for an answer and this is the only one that I can understand and make work. I have been using a the same Lookup in a large spreadsheet for about 4 years now. Recently I have been getting random results. In some of the cells I get the expected results but in others I just get a 0, not N/A or #Value#. I've made sure that my table is sorted in the correct order and that the data I'm looking for is in the furthest left column. I've also made sure that I have the correct range in my formula, nothing seems to help. What could be causing this random error in my results? I am using excel 2013. when I try to do vlookup,the first row prints correct value. when I drag the formula for other columns it prints the same first value for all the other columns even if the formula is changed. Hi there, I would appreciate your help. I created a table of VLookup formulas. Worked great, but now I am trying to sum values in several rows and I get a Zero. I would also like to average, counta and several other functions but it doesn't seem to work on the values created by VLookup. VLOOLUP not giveing correct number. How can I search the numbers with E+ in my databases of thousands records. Every time I enter a vlookup lately (I didn't use to have this problem), if returns something like =VLOOKUP(A:A,'[Restricted Detailed Employee Listing_4.14.2015_limited.xlsx]Detailed Employee Listing'!$A:$S,false,19). Please help. what function I can use instead? when using the following formula =VLOOKUP(A:B,Sheet2!A:C,3,2) getting value error. pls help. I am at a loss! I know it is difficult to see what I am doing but this is a relatively easy formula. .. I have a list of members per month for three months and have to combine all the members of those months and mark in front of the members who were present in that perticular month. I know that it can be done by vlookup but i am not able to do it. I was wondering if you could help me with an issue I have been having. I pull daily spreadsheets with information for employees. I have a column at the end that has my notes for each individual case. With each spreadsheet I use vlookup to transfer the most current notes from the previous day’s spreadsheet to the one I just pulled. The lookup value I use is the employee’s ID number which I always remember to convert to number. Every time I transfer the notes, the majority are correct but quite a few either populate as ‘0’, ‘#N/A’, or pull previous notes from much earlier spreadsheets. I’ve been on numerous excel forums looking for a solution and have tried many(locking the reference table array, sorting and filtering each spreadsheet the same way, etc) and none seem to work. I really appreciate any insight you can offer, correcting each spreadsheet has been a timely process that I feel I can be better spending doing other activities. Excellent post! Out of all the pages I looked at to resolve this problem, yours worked. So simple and Boom!! may anyone help me..? during using VLOOKUP i am facing problem, actually i have a data which have extra spaces and "" quotes etc in table array but showing simple as lookup value and obviously i am unable to get the data so pls help me.. I am using a vlookup to match sales and on hand data for item numbers that contain an'*' in them. The lookup is working except for occasion where the exact value is not found, but something close is found. I am told that the wildcard '*' is the reason the formula brings back a bad result even when the vlookup uses the FALSE condition (=vlookup(A1,G1:H13000,2,FALSE. The target looks like B110015BS***GG but pulls from B110015BSR**GG. Does anyone know how to make the formula ignore the wildcard? I tried doing a find/replace, but as a wildcard, it replaced the whole string in each field..
i just wanna know how can i show/flash the names of clients (which is in the other sheet) who paid cash in my report? same with the client who paid their accounts receivable, which i termed "collection"? i just want to show my boss the names of clients who paid their obligations (cash payment & collection of A/R). i used vlookup to find the details about the "bank" (bpi) the beg balance, the cash deposit, collections etc. what i want to solve now is how can i make the names of the clients appear in my report to see in details who the clients are already based on the data i encoded. and if my boss tries to see the details of another bank, same thing i want to appear the names of clients i encoded, also.. I keep having my vlookup column doing this. Is there something I have to do to correct this? how to highlight past dates? I think Formula is =a2<today() it is work. Thanks for your explanations. The problem with my vlookup was the formatting of the "search" data; formatting it as "number" solved the problem! It seems you may be able to help me. I am using Excel 2010. I created a drop-down list, and want to use VLOOKUP to complete other columns, with information in the table which I used for the drop-down list. The column for the drop-down is A. If I make my selection from the drop-down list, nothing happens, that is my formula, e.g:=VLOOKUP($E2,Premises!$A$2:$P$101,4,FALSE) remains in the cell, with no value provided. I checked formatting of cells to make sure it is the same. To understand your task better, we'd like to have a look at your data. You can email it to support@ablebits.com. Please add the link to this article and your comment number. Please make sure you enter the equal sign before adding the formula. Why is Excel showing a formula, not result? To help you better, we need a sample table with your data in Excel. You can email it to support@ablebits.com. Please add the link to this article and your comment number. My V-lookup is working, but the formula will not copying down the full column of data. For example, 100 cells of data, first cell will v-look up correctly, but the rest of the column can't be completed without repeating the v-lookup an additonal 99 times, in each cell. Does that make sense? Any thoughts on how to fix? THANK YOU!!!! You just saved me. TRIM...who knew! I too facing the common error like #N/A, even after i convert the look up range in number format. kindly suggest. any other alter. "Use VLOOKUP and INDIRECT to dynamically pull data from different sheets"
Since my reference cell Y3 needs to be a number and my Named Ranges can start with a number (LIST15, LIST18, LIST20) I cannot get this formula to work. I even tried to move the underscore to the right side to match the way it is in the Named Ranges and still don’t work. I get a #REF! Error in both cases. Can anyone help? Hello, I've been having some trouble using this formula. is it possible to look for a value which is the formula? I tried vlookup but not working, when I put look up value manually then it`s fine. I am facing problem during using of VLOOKUP formula , Row & column number not showing.. anyone can give your advice? I have two excel sheets one contains insurance policies issued by the insurance company through insurance broker along with the premium amount and the commission amount and another excel sheets which is provided by the insurance broker which has policies issued on behalf of the insurance company it has premium amount and the commission amount. Now my question is, i want to match both excel sheets by using vlookup. I matched large volume of data. But, when the same policy number is appears twice or thrice, vlookup showing the policy which comes first and ignores the remaining two. I want to know about the policy which are appearing twice or thrice with relevant premium amount. I read the how to get all duplicate values in the vlookup range. However, it seems like it is small volume of data. How do i it for the large volume of data? Thank you so much, Svetlana, for the troubleshooting tips! Without them, I was struggling for hours trying to get VLOOKUP to work across two excel workbooks. What finally worked for me were sorting the lookup column in ascending order, and bringing that column to lie AFTER the starting column index of the Lookup table (as you suggested above). Many thanks, especially as I did not find such trouble shooting steps in Excel also. I have two worksheets, one with the list of names with related information in each row, and the other is for the query. I provide the name in one of the cells of my query sheet, and I want to use the MATCH function to get the row number (from the names worksheet) of the specified name. Where I specify the required name to be queried in the B3 cell of the query sheet, and B2 cell has the name of the names sheet. In short, I want to use variables to specify the lookup-value and lookup-range. How do I go? This command is in the 2017 workbook and is retrieving a number from another separate 2016 workbook. Where dec2016register is the named array for a worksheet in one workbook and has a value we want to export to a worksheet within another, separate workbook. Both workbooks are open, both reside in the same folder. We defined the array, there is no data conflict with the Lookup Value in either worksheet, and the exact same command (with different arrays) works perfectly in one other application involving two separate workbooks. BUT with this one particular application, we keep getting a #NAME? error. Why? What are we doing wrong??? Formula is =IFERROR(VLOOKUP(LEFT(B42,11),Names_Awards_2016,3,FALSE),"") returns an #N/A error, however, if I replace the LEFT(B42,11) with the actual texts string ex:"Jaclyn Smit", the formula appears to work. how can I use some Vlookups in a cell;means I want to Vlookup some tables and show one of answer(or even first on)in a cell? I have been struggling with the following issue and all the recommended fixes have not worked. I am using vlookup to pull data from four other sheets. I need to be able to use the results in cell to trigger the next search, however what happens is that the next vlookup looks up the values in the formuala, not the result. Instead of looking for the displayed value in E3, it goes chasing down the previous VLOOKUP and tries to find A2, and if THAT was another formula, it just keeps going. I have changed all cell formats to general, number or anything but text and have turned off 'display formulas'. I have pay grade coded as 4-X1, 4-X2 representing salary 50,000 and 65,000 in two columns. Why do I get this error? please assist!! Very nice post. Solve my problem. There is a problem when I try to compare two excel sheets using vlookup and if both the columns are empty which are compared. It returns an error. what to do in this condition??? I am looking for exact match for the value being searched. However, it is giving me values as per sequence. I am doing match. If we put =iferror...;" ") we get blank cells instead of #N/A. That is ok, BUT in that case I want to keep my original number. Is it possible? In vlook up is it possible that value can be increased in row? i have a spreedsheet that i am running the following function thru =REPLACE($D344,1,2,VLOOKUP(LEFT($D344,2)+0,$AB$3:$AF$14,2,0)). Column D contains 4 digit values, ranging from 3700-37DF, i do have a few cells in coulmn D that contain 3A00, 3B00, 3C00 and on these cells i am getting #VALUE! errors. can someone help? File>Options>Advanced>Display options for this worksheet: (use the drop down arrow to select the correct worksheet if more than one in your file). Good luck with the #N/A issue. hope you can help. I am using the vlookup function from an exported spreadsheet. the cells in the column are a combination of of text or dashes and some appear as #NAME? When I click into the cell, the actual words appear but not when you look at the column. excel is reading it as a formula but it is not. How do I fix it? I have searched for answers but not able to find a solution. THANK YOU! I learned a valuable lesson and was able to solve my problem! : "Always use absolute cell references (with the $ sign) in table arrays, e.g. $A$2:$C$100 or $A:$C." Thank you I couldn't get my VLookup to work and your article worked.when they work its brilliant when they don't your tearing your hair out. Great article. I have the following formula to pull column 33 from the URL spreadsheet specified. 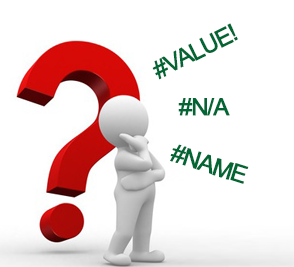 I get the #NA, Did not find value in vlookup evaluation. =transpose (query(importrange("1EG2Qcodvx1IkbUGbvQeJRuBKHoOYtMLRCY5a73_8uWI","SEPT!$A$1:$AG"),"Select Col33 where Col4 = """&E1&""" ",FALSE)) and it pulls in the correct column info, but it gives me the cell above the one referenced. In other words, I am looking up the email address to return the total number of available days and if it is email address on row 9, it gives me the email address for row 8. Vlook Up is skipping identical data with no change in formula. Vlook Up entered at column AO. Referencing column AL and pulling from column 2 of array (which contains Program name) located on different tab of same file. The NA77BIO reference is unchanged, yet #N/A is returned further down in the sheet. I have an issue in Vlookup, i am doing vlookup in my laptop but it is taking same values for all, please help me how to salve. The below is the example. but it doesn't work. Is there any easy fix? Trying to use VLOOKUP with cells that contains both text and numbers. I tried changing to general, text, and number and still will not work with the VLOOKUP. I don't think the cell format is the issue. These are my first thoughts to check. Check to be certain the data you want VLOOKUP to use as a reference is in the current sheet's A2 cell. Is this current workbook's name THRESHOLDITEMLISTING5918.xlsx? If not, can you access this Thresholditemlistings workbook? Does it require permissions you don't have? Does Sheet 1 of that Thresholditemlistings workbook contain the list of info you're referencing? Is the data in A2 through G818? Is the data in the first column of sheet 1? In my case the error was because of a simple whitespace. Make sure that the value in the lookout column didn't have any white spaces. To remove any white space Just select all the values and hit Ctr+H and replace " " with just "". Took quite a while to figure out. When changing the column from 10 to 11, the formula returns #REF. There is a value in column 11 and it's formatted exactly the same as column 10. The formula works from columns 1-10, but does not work from column 11 to the end of the spreadsheet. Can it not look farther than column 10? When trying to do a Vlookup to another file my it is not allowing me to even select the table array I want to search. why is this happening? - Where you misspelled the "Exact Match" argument, eg providing "F" instead of "FALSE"
I am using Microsoft Excel on a Mac. I've used VLOOKUP for years in very complicated models with no issues. I am now stumped: I have a simple table that works for VLOOKUP for all words except those that begin with "Se" up until words that begin with "Si". So if I look up values that go with Sammy, it's fine, with Stan or Tiger, all fine, but it just returns zeroes if I look up values that go with Selma, Shark, Siam, etc. What gives? Ugh, sorry for the bother, I found the issue. I had corrected the spelling of scullcap from skullcap in the table but hadn't resorted it. I am having trouble with my Vlookup after I had got it working. I'm not sure if the list is just too big or formatted wrong. I have it in the left most column searching a different sheet. I'm updating a mailing list with a list I already have and pulling from unique numbers that are between 5 and 6 digits. For whatever reason these digits are no longer working for the vlookup. I have tried to make them text and number and it just won't pull any data no matter how small I make the vlookup. Even just 3 cells that do contain the numbers. I'm am at a loss. I can't make it work, even though it should work. Is it because of the numbers being between 5 and 6 digits? I am having problems with my Vlookup, the trouble shooting I have done is making sure the lookup value lengths are the same on both spreadsheets and the formats of the lookup cells are the same, I have also done an error check on both spreadsheets everything should be working fine but the formula result is not showing. What could I be doing wrong? =VLOOKUP(TRIM($A2),Sheet1!$A:$P,8,FALSE) this returns a 0 value, if I change false to true no value and it should be returning a value of 160. I have an issue with a vlookup that, I am certain is structured correctly. When I double click to have the cells auto-polulate with the vlookup formula, most calculate correctly. However, a handfull will calculate as #N/A. When I look at the formula, somehow the second parameter has changed to exclude a portion of the array or table. This =VLOOKUP(D3,A3:B22,2) should read like this =VLOOKUP(D3,A1:B22,2).